It is a rare occurrence to receive the promo of a new album in the morning, and have the opportunity of speaking, unplanned, with the artist concerned later the same day. Better known as a guitarist with Mostly Autumn, Liam Davison was attending the Best Of The Year awards show at the Classic Rock Society, and it was after the band had won the 'Best Band' and 'Best Album' categories (and several others individually or collectively) that I had the chance to speak with the slightly diffident subject of this review. "'Treasure' has been a long-time in coming" he confided, "and would not have happened but for the encouragement of various people and also Wymer Records". They say we all have a book in us, but few actually write it. I guess that all musicians have a solo album in them but few actually craft one. 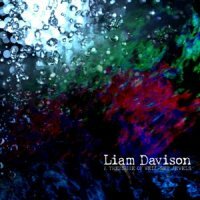 In the case of Liam Davison, the crafting has been well worth the wait, for this is an absolute peach of an album, and one that has huge appeal well beyond the Mostly Autumn cognoscenti. Entirely written by the man himself (one song, the wonderful – 'Once In A Lifetime' is a co-write with Heather Findlay who is also the vocal soloist on the track), I was personally amazed by the talent revealed by a guy who totally shuns the limelight when playing with Mostly Autumn. It is not only former colleague Heather Findlay who is to be found on the album, but also current cohorts Anne-Marie Helder, Iain Jennings and Gavin Griffiths along with bassist Paul Teasdale and keyboardist/arranger Simon Waggott. Liam shares vocals with both Heather and Anne-Marie and the three distinctively different voices provide for a cornucopia of aural delights! Liam sings many of the lead vocals but additionally several songs are duets between Liam and either Anne-Marie or Heather and there is great use of harmonisation. Instrumentally, Liam's guitar playing is a revelation and the collaboration with his guest instrumentalists works superbly well throughout the eight songs on the album: but never more so than on 'Heading Home' where the interplay of free-flowing lead guitar with a huge bass riff and magnificent Hammond organ is simply exquisite, while on closing number (and longest track at 8:25) 'Picture Postcard' there is a candescent guitar solo, this song building up into a magnificent crescendo before fading away (shame!) Here and indeed throughout 'Treasure' Floydian references abound, and also especially predominate in 'Eternally Yours'. I do have to provide a small note of caution, however: and that concerns the opening song 'Ride The Seventh Wave' which is stylistically quite different from anything else on the album and is a rather "clunky" and modern sounding hard rocker. Whatever you do, do NOT base your judgement about liking/not liking this album on hearing this song alone. I have grown to like it over repeated plays, but was initially uncertain about it. That was certainly not the case with the other seven tracks, and 'Treasure' will quite probably feature in my Top 20 albums of the year – it is that good!